For people who cut their hair at home, to achieve a good result takes skill, bright lighting, and good mirrors. The Self-Cut System's three-way mirror design makes seeing your head easy from any angle and allows you to use your hands for cutting instead of holding a mirror. The product is well designed, easy to use, and highly recommended for anyone who cuts their own hair. If you go to the Self-Cut website, turn your volume down first as a music video about the product starts playing automatically. The Self-Cut System is a three-way mirror that hangs over the door and allows you to see your head from all angles. It allows you to cut your own hair while keeping you from having to hold a hand mirror to see the sides and back of your head. It can save you thousands of dollars per year if you're brave enough to attempt to cut your own hair at home. First, a disclaimer. I own barber salons and make a living from cutting men's hair. As such, I've never been a big advocate for buzzing your hair at home. That said, there are some guys who, for whatever reason, are going to take matters into their own hands and cut their own hair while standing over the bathroom sink. 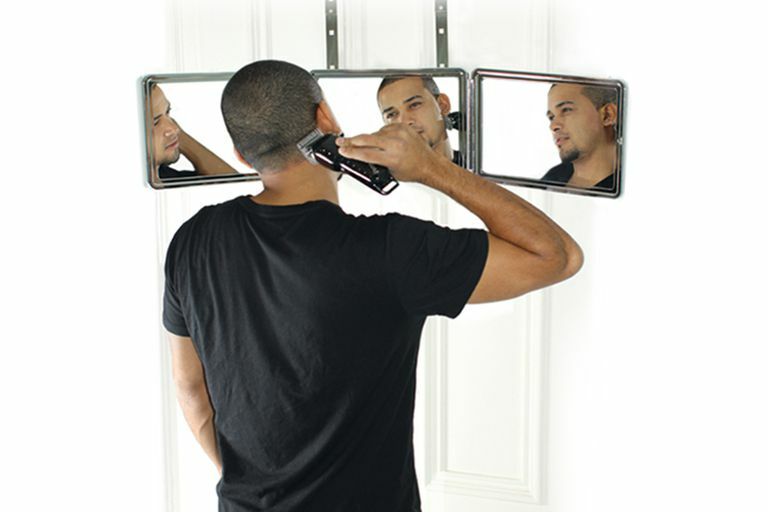 For those guys, the Self-Cut System three-way mirror can make that task much easier. 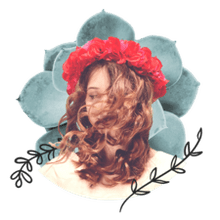 One of the biggest challenges of cutting your own hair is being able to see the sides and back of your head without having to contort your body into odd positions or fumble with a hand mirror. Holding a traditional hand mirror while looking into a wall mirror also ties up one of your hands. For quick touch-ups, I've always kept a wall-mounted telescoping mirror positioned between me and the bathroom mirror to free up both hands. This works fairly well, but a self-haircutter would still have to occasionally twist into an odd position to see their head from all angles. The Self-Cut System eliminates that problem. The Self-Cut System is basically a three-way mirror that simply hangs over the door. You open up its three hinged panels and stand in the center -- by turning your head and/or adjusting the angle of the panels, you can see the front, back, and sides of your melon. If you have ever tried cutting your own hair, you know that it can take some practice knowing which way to move as things in the mirror are reversed. I recommend going through the motions of cutting your hair before you actually do any real buzzing. The Self-Cut System comes with an instructional DVD which shows you the basics of cutting your own hair using the System. The DVD shows guys cutting their own hair and this really gives you an idea of the angles and techniques used for doing it yourself. That said, before trying to cut your own hair be prepared for the consequence if you screw it up -- not everyone can do it right. As far as quality goes, the Self-Cut System is well designed and constructed. The mounting hangers could be a bit heavier as the unit felt like it might fall off if bumped the wrong way. The product could also benefit from a permanent mounting option so you don't have to hang it up every time you need to use it. A few screws and some double-sided foam tape would probably do the trick if you want to leave it mounted where it is. It would also be great to see a version with some form of lighting around its edges (like those illuminated make-up mirrors). Because the Self-Cut System is designed to hang over a door where the room lighting is not likely as good, a lighted version would be a welcome addition to the product line. Cutting your own hair is not as easy as you'd think -- it takes some natural skill, the right lighting, and a good mirror. For the latter, the Self-Cut System does the trick quite nicely.